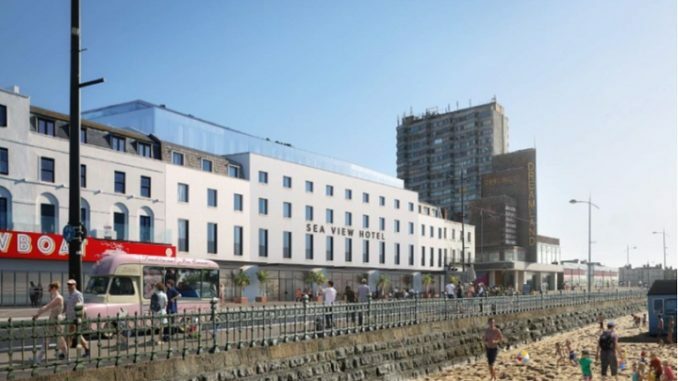 Plans for a new 124 bedroom hotel in Margate are likely to be rejected by Thanet council’s planning committee next week. 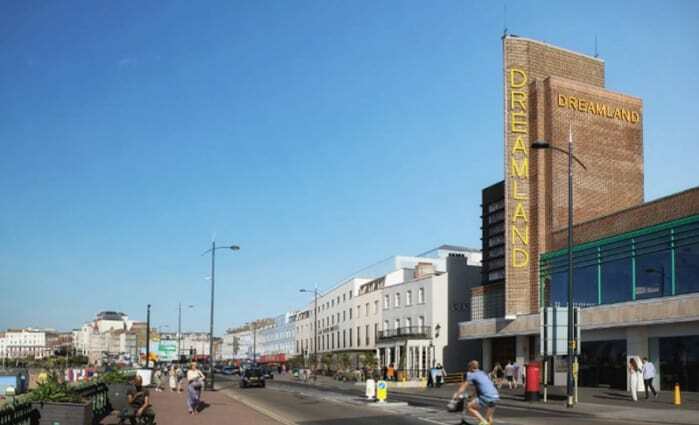 Plans were to flatten Ziigy’s rooftop bar and the adjacent empty property in Marine Terrace ready for work to start on a 5-storey ‘lifestyle’ hotel proposed by Dreamland’s operating company, Margate Estates. But Thanet council planning officers are recommending that the application is refused, saying: “Unfortunately, whilst a number of economic, social and environmental benefits are offered by the scheme, the proposal, by virtue of its scale, height, depth and roof design, will block significant multiple long distance views of the landmark Grade II* Listed Dreamland building, whilst also creating a development that appears obtrusive and unrelated to the height and scale of development within the historic seafront terrace. 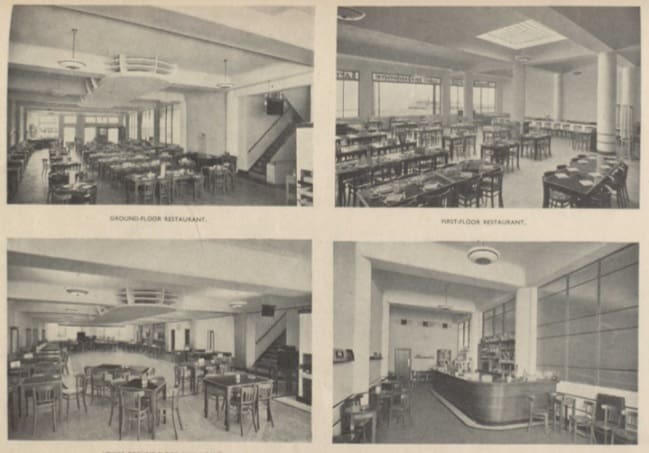 The ‘Seaview’ hotel, proposed to lie in the Margate Conservation area, was earmarked to have 124 rooms, a gymnasium, meeting rooms, a shop or café with frontage onto Marine Terrace, a restaurant and bar at the ground floor and a rooftop bar. But Margate Conservation Area Advisory Group and The Twentieth Century Society previously said a part of the town’s heritage would be lost if the properties at 48-49 Marine Terrace were demolished. Number 49, currently home to Ziggy’s rooftop bar and formerly Escape nightclub, was constructed in 1936 as the West End Restaurant. 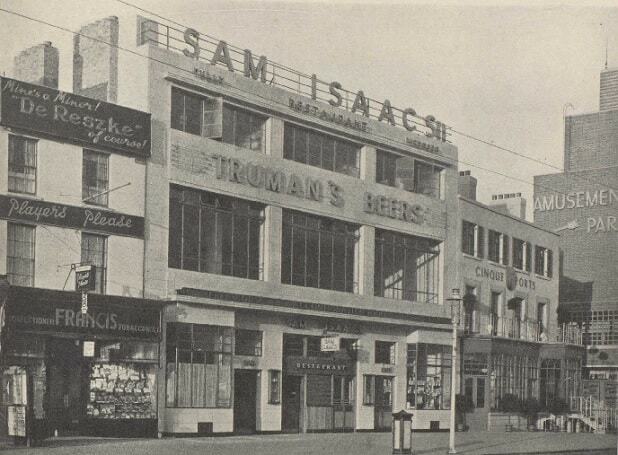 It was commissioned by Samuel Isaacs (1856-1939), a Jewish man who opened his first fish and chip restaurant in the East End of London in 1896. It served fish and chips, bread and butter, and tea for nine pence. It was the first of its kind aimed at giving the working class the opportunity to eat in at affordable prices. Sam Isaacs’ trademark was the phrase “This is the Plaice“, combined with a picture of the punned-upon fish. Margate Estates said the project would create 62 jobs within the hotel; 103 direct construction jobs over 3 years and 52 indirect construction jobs across the region over 3 years. Unbelievable! On that basis we will have no new hotels in the seafront area- ever. Hotels will bring undoubted economic benefit with jobs much needed revenue to the area all year round. Ok then lets have loads of empty scruffy buildings–thats SO much better!!! We turned down the Tesco/Arlington development partly due to “ruining the towns shops” If that had been encouraged at the time most of that eyesore corner would be gone now. How can we possibly afford to turn down investment in the town. The Secretary of State approved the Tesco/Arlington development following a Public Enquiry. That included outline planning permission for a four storey hotel on the seafront adjacent to the Dreamland building. Tesco pulled out which is why the store was not built. Apparently, no developer or hotel chain has approached the current leaseholder of the site with a view to taking up the hotel option. With one permission already in place, it will be difficult for another to be refused . . . The same bureaucrats that say “The proposed development will result in increased recreational pressure on the Thanet Coast and Sandwich Bay Special Protection Area (SPA), and Sandwich Bay and Hacklinge Marshes Site of Special Scientific Interest (SSSI).” support of putting thousands of houses elsewhere in Thanet which will totally destroy the environment. If it wasn’t so devastating to Thanet it would be laughable. They should all be fired and replaced with people who can at least be consistent. Ziggy’s is an excellent example of 1930s architecture..why can’t they work with what’s already there? It has come to my attention that officers do not live In Thanet .is this going the same way as Arlington square.left derelict.i suppose they are the same people behind this.if they do not know the seafront is in a conservation area should study the history about the area.ziggys roof top bar is included in the development. Once again the “stop any and all change or progress” brigade scupper any chance of anything good ever happening in Thanet. I wonder if ANY scheme in Thanet will ever get the support of the luddites. Bet plans for another amusement arcade for be granted …..
Margate desperately needs more hotel availability in summer. Ive often try to book and I usually have to stay outside of town. I thought Margate was trying to rejuvenate its seafront an create jobs? This is the same committee that approved 14 one bed flats in an office building surrounded by grade 2 georgian town houses in Ramsgate conservation area. Dreamland as an organisation are meting real efforts to improve a derilict seafront and boost the local economy.